Some of you may have noticed it has been a while since our last blog post. That is because we have been maintaining blog silence for the past few weeks, as the sale of Starship was pending! 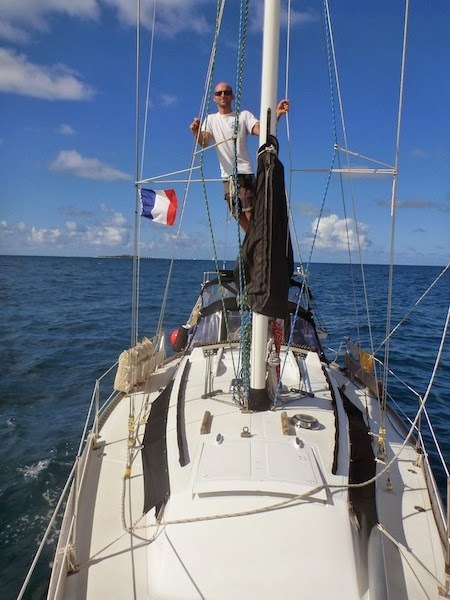 It all started upon our arrival in New Caledonia, when we informed our yacht broker (located back in French Polynesia) of our arrival in Noumea and our desire to lower the price of Starship one last time before we cancelled our contract and sailed on to Australia. A few days passed and we were preparing to sail for Australia, when we received an email that someone wanted to come and take a look at Starship. Unfortunately the potential buyer couldn’t come out to see the boat for nearly a week, but that gave us the time we needed to get her gleaming and tidy. We spent a weekend at Ilot Maitre with our good friends from Hydroquest, enjoying the beautiful island and cleaning Starship. Ilot Maitre is only 3nm outside of Noumea, but the sea life and scenery is spectacular! We returned to Noumea and the buyer came aboard with his friend and the local ‘yacht broker’ Thierry. They had a look around the boat and we heard a lot of ‘C’est Super, C’est Super’, but also a lot of ’27 percent! 27 percent!’, the cost to import an American boat in New Caledonia. There was no doubt the buyer loved Starship, but it seemed the high cost of import was going to kill the deal. The buyer made us a lower offer, citing the high cost of import, but we rejected it since we had so much interest in Australia. We informed the buyer we would be checking out of the country at 10:00am the next day, and our price was firm. We resigned ourselves to sailing to Australia, with a good practice run for showing the boat under our belts. The next morning at 8am our Skype phone starting ringing. We just missed the call, but a text message was waiting that said the buyer would pay our asking price! Anne-Marie and I were both ecstatic! A purchase agreement was drafted and signed that day with a 10% non-refundable deposit, and no conditions on the sale. Little did the buyer or we realize that signing the purchase agreement was the easy part, the difficulty of the New Caledonia bureaucracy still laid ahead! Luckily for us, the buyer was responsible for dealing with the bureaucracy, since the officials often spoke little English, it would have been nearly impossible for us to sift through it all. Over the next couple of weeks it seemed as though hurdle after hurdle was thrown in front of us that threatened to kill the deal. 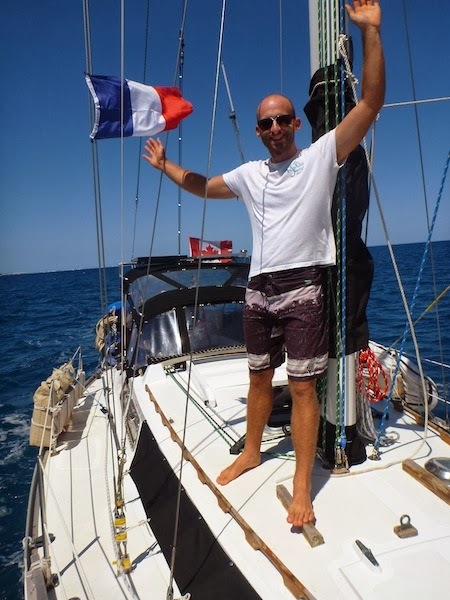 It was an emotional roller coaster ride, as our window for sailing to Australia was closing, but finally everything came together and the bill of sale was signed yesterday! While all of this was going on, we were trying to figure out what do with all our stuff and how to get ourselves to Australia. 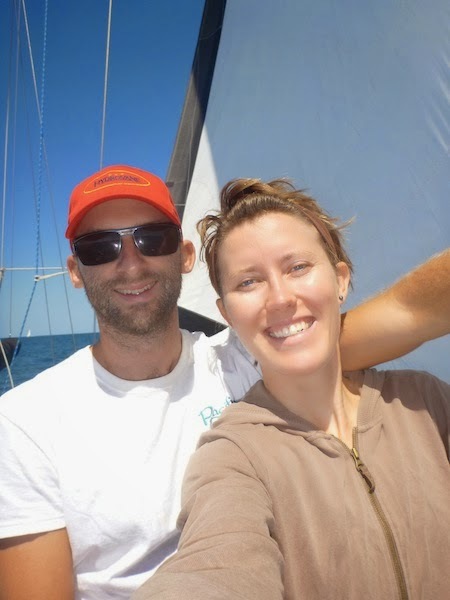 Our friends Atmo and Petra from the 44ft Privilege catamaran Elfrun, self-described ‘German Hippies’, were kind enough to offer us crew positions on the final leg to Australia! Many times during the roller coaster ride of bureaucratic red tape, we thought for sure they would leave before we had the deal finalized. Luckily, for us at least, poor weather has kept them here long enough to take us, and all our stuff, to Australia. It is certainly sad to see Starship go. She’s carried us safely across the world’s largest ocean, she’s brought us to spectacular anchorages and she’s been our first home as a married couple. Her walls are lined with all the tears, laughs, fears and joys of our journey. We’re both very attached to our beautiful boat, but we know it’s time for our next chapter and we’re ready to open that door. We’re delighted to see her go to a happy and adventurous couple that have plans to continue cruising on her, like she is meant for. There will be a couple more blog posts yet to come, including what we think of sailing on a catamaran, our time in Australia, and a recap of our trip. Congratulations! it's been exhilarating to follow your adventures and has continued to stoke our excitement about our impending trip in just under 2 years from now. Very proud of your courage and curious how the two of you are different now as a couple, what this experience has done, good, bad or indifferent...? We were married just this year and SeaGlub is our first home as a married couple. Thanks for following the blog and your kind comments. Any changes to us as a couple have been entirely 100% positive. We've gotten really good at problem solving together and communicating effectively, especially during high stress situations. I've always felt extremely close to Chris, but sharing so many tears of both joy and frustration together as we've sailed across oceans has bonded us even closer in a wonderful way I hadn't imagined. Good luck in your preparation and send us the link to your blog when you set off! I knew we had more in common that appeared on the surface when I first met you. You moved into the High Street house and i saw that the pic of that bicycle trailer you had built. Remember i used to send you that Rob Zombie youtube video of the song Educated Horses: "Foxy Foxy, what's it going to be?" Well now, Thanks for finally letting me know! What a great Team: I respect and am very happy for you and Annie, to boldly follow your instincts. To venture out and do what some people can't envision - and what most others don't even considered, let alone do. In my mid-20s, I was outside of the states for 2 out of 4 years on several different adventures. The most memorial was sailing around the south pacific up to Guam and the Mariana Islands for 3 months with a couple of Aussies. It's something I've never forgotten or regretted. Before i left, everyone asked, what are you going to do when you get back? I usually answered, I don't know, but I'll do it then. And what I did was drive my faithful Saab from Michigan to Palo Alto to pursue more ventures. Keep up the good work and never ever, F'ing ever, be less than relentless in following your instinctive passion for your future.